Burbank, CA – Called the Walt Disney of the martial arts world because of his innovations, design concepts, and establishing a unique place for families to visit and enjoy, Martial Arts History Museum president Michael Matsuda provides a one-on-one interview focusing on the creation of the world's first and only museum dedicated to the arts. Matsuda, a former magazine publisher, Disney graphic artist, accomplished book author and one of the world's leading authorities on martial arts history, expresses his insights about the museum and the positive and inspiration effect it has on young visitors to the facility. 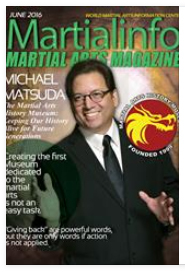 Founded in 1999, the Martial Arts History Museum first started as a traveling exhibit which took Matsuda across the nation for over four years. In 2006, the museum opened its doors in Santa Clarita, CA and relocated to Burbank, CA in 2010. Since then, it has attracted thousands of kids wanting to learn about martial arts history, art and tradition. The Martial Arts History Museum entertains a variety of young visitors from home schools, Unified School District schools, church groups, martial arts studios and more. Competing for visitation bragging rights are vast number of senior group tours. “We work with a lot of Alzheimer and Dimension patients, physically and mentally challenged individuals and more,” notes museum president Michael Matsuda. “The Martial Arts History Museum is a strong member of the Burbank community, but because we are located so near the airport, we have had a visitor from every country in the world. The martial arts is our common denominator for the world. It is practiced in every country,” says Matsuda. Although the museum has an abundance of young children visiting, it has to turn away a number of larger groups. “We get a lot of requests for tours but because we are not as big as the Natural History Museum, which brings in thousands of kids everyday, we don't have a large enough facility to support that many kids. This is why I encourage those reading this article to consider making a generous financial donation to the Martial Arts History Museum. It's not a place about violence, but rather a place about history, art, tradition and understanding diverse cultures,” concludes Matsuda. or call (818) 478-1722 or email at info@mamuseum.com. The Martial Arts History Museum is a Non-Profit 501(c)(3) organization and donations are tax-deductible.